There really was no answer to that, and Zac plonked himself down quite prepared to be judge, jury and executioner. Sally questioned why Ole felt he had to raise his voice, Ole replied that she always raised her voice. Zac decreed, “He’s got you there.” And so it went on, until it came to allocating jobs around the house. Mum, “Actually Zac, you only do the bin in the kitchen. You need to do ALL of the bins”. Footnote: The bins are still overflowing. Tomorrow is 13th October. National No Bra Day. Watch out lads, there are women out there threatening to let loose their tatas! I kid you not. We could all be tripping over them. Best stay at home! I was in Bicester last week. Bloody awful journey. Pouring with rain, treacherous roads, not pleasant. However, by lunchtime it had cleared up and was actually quite pleasant. The office is a ten minute walk from Bicester town centre, over a level crossing. The level crossing has been closed to traffic for quite some time, but last week it was also closed to people. The caring council had laid on transport, so you had to walk to the level crossing, wait for a taxi, then take a five mile or so ride to the town. Now, the town is actually quite small, and when you get dropped off in Market Square you are really in the centre already. Unfortunately, on the way back, you have to take the ten minute walk to the level crossing to get the return taxi, another five mile or so journey. Surely the men working on the level crossing have to have a lunch break (there was certainly no sign of any activity when I was there), and surely the most popular time for people to go across the level crossing and into town is lunchtime. So surely it is not beyond the wit of man to figure out that for a certain amount of time, say between 12 and 1, the ten yards of the level crossing could be opened up to pedestrians to get lunch, go to the bank, or even just to get some exercise? Sally went back to work this last week. I think she went in for just one day, maybe two, but what an effect it had. In just two days we (i.e. me and the boys) managed to allow a whole week of pots to accumulate, at least three week’s washing, and about a month’s worth of untidiness. If she ever went full time I think we would be cavemen within a week! Gabi is getting ever closer to the birth of my first grandchild, and now it seems that it may be sooner than expected. The medics have recommended being induced a week early, which looks like coinciding with Sally, myself and the boys being on a Harry Potter train in Orlando. Expelliamus! Where did all of my free time go? Ive got a ton of books to work on, a new musical about a rock & roll diner, and business opportunities that need due consideration. Something’s got to give. Maybe I’ll have to give up the day job. Had to laugh when my sister posted on Facebook that she was listening to Cracklin Rosie whilst waiting for an X-Ray. “Can’t beat a bit of Johnny Cash” was her comment. Would have loved to have seen the reaction as she put on her best deep voiced Arkansas drawl to sing the Neil Diamond classic! Last Friday was one of my favourite days of the year. Hospitality at York Races, but it wasn’t all plain sailing. I was, as ever, early, and I waited in the car as Sally put the finishing touches to yet another stunning outfit! She eventually came out of the door, got in the car, got out of the car, went back inside, came back out, got back in the car, and off we went. A mile or so later the doubts started. “Did you leave the key for Zac?” “No, I left the key in the door. You were last out so you must have left it.” “Not sure I did. But I suppose I must have done.” There were clear doubts in her mind, but then the certainty. “I definitely didn’t leave any money out for Zac for his tea. You shouldn’t have waited in the car. That doesn’t work for me.” So, you see, it was all my fault! Actually, the key was where it should be, and although I asked Ole to get some cash for Zac, our youngest was much more resourceful and procured his own funds, and more besides. A couple of hours later all was forgotten as copious amounts of champagne were downed, but the perils of waiting in the car are there for all to see. Finally, a thought for you. When people die it is often their pets that get left behind, probably feeling as much pain as close friends and family. I think it must be the same for pan lids. Sally has burnt countless pans, but rarely the lid as well. No, those unfortunate ceramic or glass “hats” remain in a drawer like little orphaned children. Now, you may think that I am exaggerating, but as you can see below our particular drawer is overflowing with sad and lonely pieces. Warning: Some readers may find the following scenes distressing. The handle on this lid may look like an upturned smile, but this sad little urchin lost its bottom half when a cabbage went badly wrong. 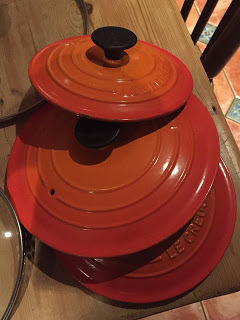 This larger lid was on top of a pan of stew, carefully letting out steam through carefully placed holes. Sadly, the stew boiled dry, then continued to burn beyond repair. The lid was unscathed, other than the mental scars that remain. 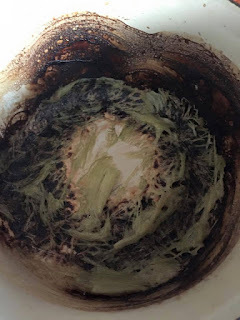 Carrots can be considered one of the easiest things to cook, but on this occasion the blackened vegetables found their final resting place in the outside bin leaving the bewildered lid wondering just what happened. So often we see that when an elderly person dies their life partner passes away a short time later. Maybe that was the case here as two pans were charred beyond repair in quick succession. These three lost their respective pans in quick succession thanks to a mixture of pasta, peas and chilli. At least they still have each other. Not even a lifetime guarantee could prevent these covers from being cruelly left alone in this world. Once again spaghetti was part of the problem, as well as soup, but the final death came as part of the great alien rhubarb fire in the spring of 2015.